© Greg Lavaty. Photographed at High Island, spring, 2009. Seasonal Occurrence: Uncommon in spring; rare in fall. Profile by Glenn Olsen: With only a quick glance the color pattern of the Blackpoll may bring to mind the similarly attractive Black-and-white Warbler. However upon closer observation, the plumage pattern is quite different with the male Blackpoll having a solid black crown and prominent white cheek compared to the male Black-and-white's striped head and crown. The female without very close observation could easily be confused with several other species. The female is less streaked than the male, lacks the black crown and white cheek, and the wings and back are olive green to gray in color. The Blackpoll, like the Black-and-white Warbler is a Neotropical migrant and both are most often observed during the spring migration. 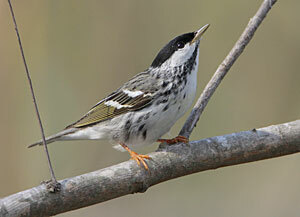 However, the Black-and-white is abundant during migration and the Blackpoll is uncommon to rare in any given year. 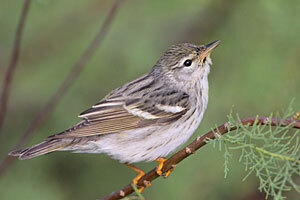 The Blackpoll can also be seen in fall migration. The primary breeding range is the northern coniferous forests of Canada, Alaska, Labrador, and Newfoundland with US breeding occurring in the spruce-fir forests of northern New England. In migration and on the breeding grounds the Blackpoll feeds primarily on insects. Their diet consists of aphids, sawflies, canker worms, scale insects and the eggs of many insects. After establishing a territory and attracting a mate, a nest of about 4 1/2 inches diameter and 3 inches deep is built 2 to 7 feet off the ground in a conifer tree, usually spruce or fir. The winter range includes the West Indies, primarily northern South America but as far south as Ecuador and Chile. From winter grounds to breeding grounds is a migration distance of 2,500 to 3,000 miles. And it makes this migration two times per year!!. Amazing for a 5 and half-inch warbler. Comments by Don Verser: Fall Blackpolls look very different from spring birds and are easily confused with Bay-breasted Warblers. Only one record thought to be Blackpoll, 22 September 1999 at Sabine Woods. Fall migration is decidedly towards northeastern states and overwater to South America. In the fall Blackpolls are very rare in Texas.